I have to admit I went vegan into phases, and it did take some time before I gave up seafood. Now I realize that there are smart ways to re-create the taste in order to eat a perfectly delicious cruelty-free crab cake! Over the years I’ve seen different “fishy” ingredients and seasonings in vegan crab cakes. Jackfruit, hearts of palm, artichoke hearts, and even zucchini. Tried them all, love them all. 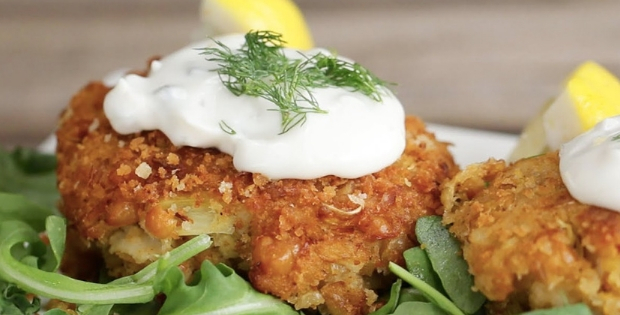 These vegan crabless cakes are also made with chopped up chickpeas to add a little bit more heartiness, since the artichoke hearts don’t have much in the way of calories. The result is a satisfying, crispy, tender, nicely seasoned vegan cake with a little flakiness and lots of flavor. 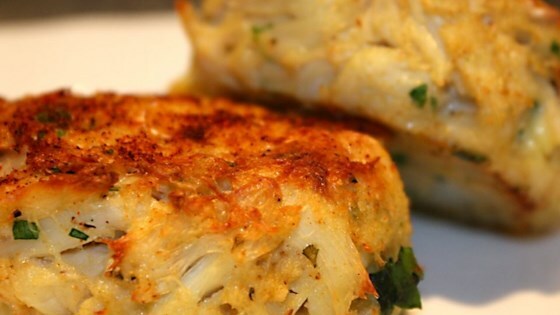 These Vegan Crab Cakes are crispy on the outside, yet moist & flaky on the inside. They can be enjoyed as an appetizer, side or a main dish. For 928 exceptionally delicious vegan recipes you won’t find anywhere online, Download The 928 Tastiest Vegan Picks, hand-picked from the world’s BEST cookbooks! Add chickpeas, hearts of palm, and artichoke hearts to food processor. Pulse until mixture is chopped, yet still slightly chunky. Transfer mixture to large mixing bowl and add 1 cup of bread crumbs, ¼ cup vegan mayonnaise, Dijon mustard, 1 teaspoon lemon juice, salt, pepper, and Old Bay seasoning, and mix well. Form the mixture into 6 1-inch thick patties. Dip each patty in remaining ½ cup of bread crumbs. Heat a pan of oil to 350˚F (180˚C). Fry each patty for 3-6 minutes per side, until golden brown. Transfer to paper towel-lined plate to absorb excess oil. For tartar sauce, combine ½ cup vegan mayo, relish, and 1 teaspoon lemon juice in mixing bowl. Top the patties with tartar sauce, dill, and lemon juice. Enjoy and don’t forget to tag @iinourishgently on Instagram if you recreate this delicious recipe!